Ready for Battle: Canne is participating the Aniblog Tourney! You must have already known about this Aniblog Tourney. If not, I’ll brief it to you. Aniblog Tourney is a project created by Scamp and RP. 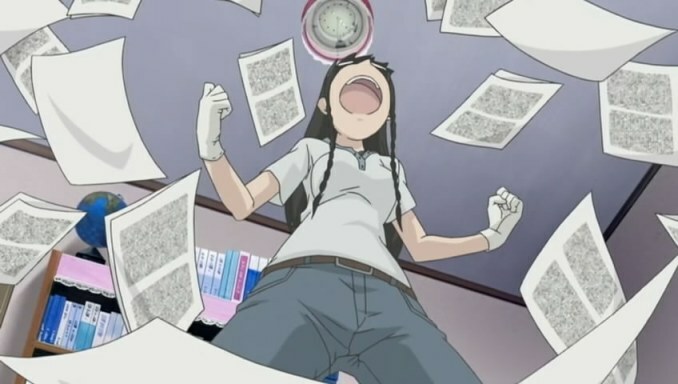 It gathers 96 anime blogs, arrange them so that they compete each other in play-off style. The winners of each round is decided by popular vote. 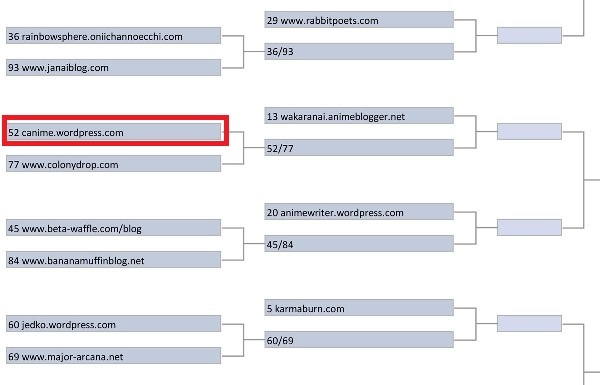 In short, it is the most awesome event in aniblog sphere in years and I, seeded 52, am also participating! My reaction: I was extremely happy that I was chosen as one of the competitors. It was such an honor and though I will probably get eliminated in the first round since I’m up against the famous Colony Drop, I still consider this as an achievement nevertheless. So you are giving up? If I were the kind of person who gave up on things before they even started, I would not be here today. No, I’m not giving up. To my regular readers, please vote for me!… For those new to my blog, feel free to look around and if you find this blog appealing, please vote for me, too! Canne’s anime review blog’s first round match will be opened for voting this Saturday (April 24) VOTE NOW! Since I am asking for your votes, I will properly introduce my blog to you in case your are new here. Canne’s anime review blog provides two main types of content; anime reviews and editorials. Anime reviews take up more than half of this blog’s overall contents and for the record, I only do series/movie reviews, not episodic reviews. Here are some of my previous reviews that I believe can give you general impression of my blog. I also occasionally do editorials depending on my interests and current inspiration. Here are some examples that I thing may interest you. If you like what I do here, feel free to vote! Hey Canne, I am in the tournament as well. I am facing off against the Ani-gamers blog next Monday. I will definatly vote for you!!!!!!! You have my complete and utter support. I’m not a fan of tournament formats for things like this, thanks to a fundamental flaw: it’s completely uneven. The eventual winner will not necessarily be an accurate representation of who the voters thought was the best. Format issues aside, it is a nice idea – especially as it seems more positive and lighthearted in the wake of the OEG. Best of luck! I’ll have to remember to vote for you. It’s for fun and fortunately it is fun, so far. Plus, there’s not much negative aura surrounding this game like the OEG’s. I’m still hoping OEG will come back. But in the mean time I guess we have this to fill in the gap. Good luck. I don’t care much about contests myself, well at least when it comes to blogs. But I’ll cheer you on. This tournament is a good opportunity to find aniblogs one might have been not aware of. Thank you! My vote is yours as well! Yeah, that’d be really fun! Don’t be discouraged by negative comments, I’ll be on your side! I didn’t even know this kind of thing was going on until I saw some links coming to my page from theirs. I didn’t even know people read or knew about my blog. I think these kinds of things are stupid though. It’s just a popularity contest, but secretly deep down I want to at least get somewhere. Well you’ve got my vote with ease. I hope to meet you in the finals (because that would mean that I would have made it to the finals, which is an achievement in itself). If I lose the first round I’ll be mad. Actually, I’ll be mad no matter when I lose. I’m highly competitive. I’m the kid who tried in gym class (gave the same girl a bloody nose on two occasions…she got in the way of the volleyball though it’s not my fault she’s retarded). I also got sent to the principal’s office once for yelling at the gym teacher over a call. Oh gym…..I miss it. LOL, only once? I was expecting a lot more than that. Right behind you Canne. I’ll be damned if we don’t at least push one or two of the people in our circle up there. As for the diplomatic controversy of such a competition, I’ll have to write about it soon. Doesn’t seem right for me not to address it at all. In short though, I’m not against it. Let’s get REEEEAAAAADDDYYYYYY TOOOOO RRUUUMMMMBBBBBLLLLLLEEEEEEE!!!!! Lol. Honestly, I don’t know why I’m so excited about this. Wait! I think I do now. Lol! Had a look through a lot of your entries and I love the variety of content and your writing style. Good luck! May we meet later in the tournament. Because that implies that we are in the finals — and somehow I don’t think that’s gonna happen. Tomorrow, my fate will be decided. Too bad you’re fighting a blog which outnumbers you with writers count, which is like fighting against many oponnents. Hope you get satisfied with the results above everything else! As that’s even more important than the victory. Good luck Canne! May the force be with u~ i voted for u too! Looks like you’ve pulled ahead. I hope you keep the lead! And I think you’ll have no problem advancing to the second round.